Heinrich Jacob Stärkel (known as Jacob) was born on September 5, 1846 in the colony of Bangert. Jacob's parents, Johann Heinrich (known as Heinrich) Stärkel and Amalie Knippel were both born in Norka. Sometime after 1843, the Stärkel family moved from Norka to Bangert where Heinrich had accepted a position as Kuster (a teacher-sexton). Heinrich insured that his family had a pious upbringing which had great influence on Jacob and his older brother, Wilhelm Stärkel, who would become the renowned pastor of Norka. In 1866, Jacob married Katharina Elisabeth Schäfer (known as Katharina) who was born in the colony of Grimm. Jacob and Katharina had 13 children, of which 10 survived to adulthood despite the family's frequent migrations. Their eldest son was born in Tscherbakowka, the next five children (from 1868 to 1875) were born in the colony of Anton, where Jacob appears to have followed his father's footsteps serving as Kuster. Around 1876, the family later moved to the daughter colony of Neu-Hussenbach in Rev. Wilhelm Stärkel's parish of Eckheim on the Wiesenseite (meadow side of the Volga River). In Neu-Hussenbach (now Pervomayskoye) two more children were born. Both Jacob and his brother Wilhelm were pietists. 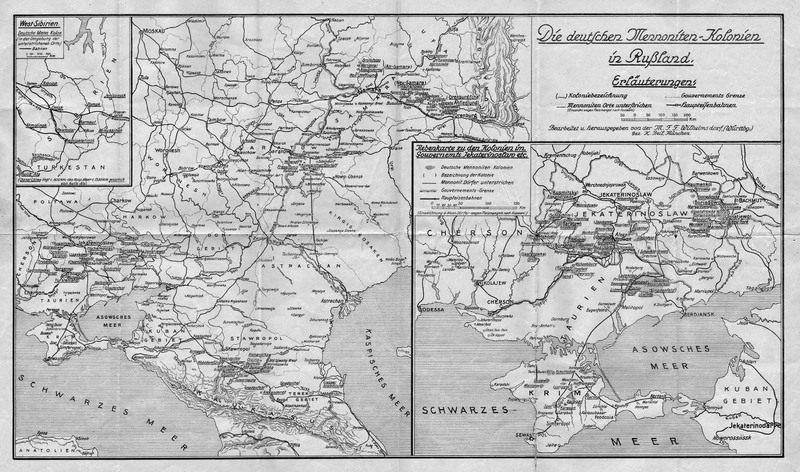 During Jacob's time in Neu-Hussenbach, he came into contact with a group of religious visionaries, led by Claas Epp, Jr., a businessman and teacher who lived in the neighboring Am Trakt Mennonite settlement which had been founded in 1853 in an area northwest of Neu-Hussenbach in Samara Province (now Rozovoye). Jacob was attracted to their views which were based on the belief that the Second Coming was near. Epp predicted that Christ would return on March 8, 1889 and meet the faithful in central Asia. The Mennonites also resisted recent Russification efforts and planned to seek a new homeland in which they could freely practice their religion without being liable for military service, which is contrary to their beliefs. Jacob decided that his family would join the Mennonite migration to Central Asia where Epp predicted they would find a refuge from the Great Tribulation. 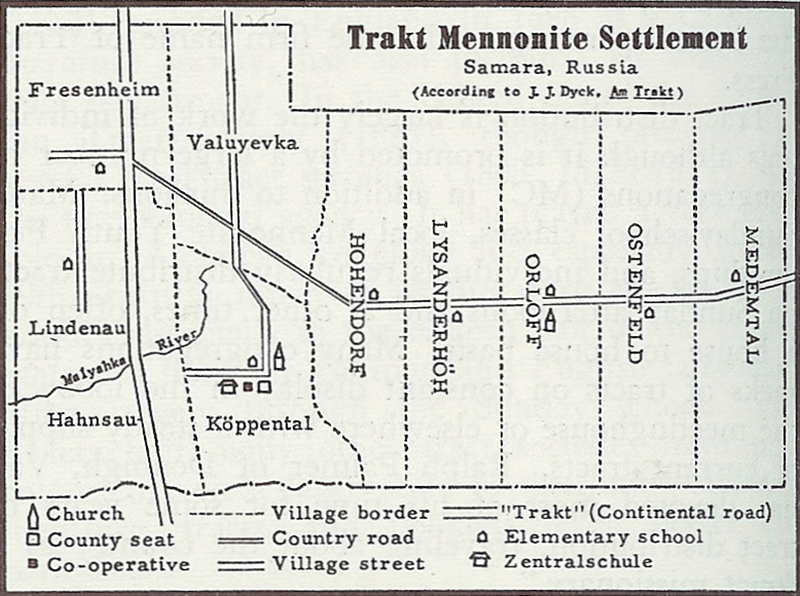 Map of the Trakt Mennonite Settlement. Source: Global Anabaptist Mennonite Encyclopedia Online. Map showing the German Mennonite colonies in Russia. The Trakt Mennonite settlements are shown on the center map, southeast of the city of Saratov. Click to view a larger image. On September 1, 1881, Jacob's family left the Volga Wiesenseite with the last of five wagon trains that undertook the migration in the years 1880 to 1881. The route took the group deep into frontier territory and across the Karakum desert. Jacob and his family suffered severe hardships inflicted by a harsh climate, poor drinking water and outbreaks of smallpox during the journey. A son, Wilhelm, was born and died during their travels. When the family reached the banks of the Amu Darya River, they were loaded on barges called kayuks which carried them downstream. The sandy cliffs along the banks of the river provided a natural amphitheater for the Mennonites as they sang about their journey to a promised land. In early October 1882, the trekkers reached the Russian outpost of Petro-Alexandrovsk where they bought home construction supplies at the Russian depot. Ten days later and one hundred miles further downstream, a large group that included Jacob's family arrived in the Khanate of Khiva, south of the Aral Sea. Khiva had been attacked and conquered by the Russian General Von Kaufmann in May 1873. Although the Russian Empire now controlled the Khanate, it nominally allowed Khiva to remain as a quasi-independent protectorate. The khan granted Claas Epp's group a piece of land along the Laudan canal near the Amu Darya and they named the settlement Lausan (near today's city of Takhiatash, Uzbekistan). The trekkers did not become Khivan citizens when they left their Russian citizenship at the border. They merely saw themselves as a community in Christ, with their only allegiance to God. In Lausen, another son, Nathaniel, was born in 1883. The severe hardships suffered by the Lausan settlers in the harsh and unfamiliar environment soon proved too much for them. In 1883, a schism within the group resulted in a decision by approximately one-half of the settlers to migrate to the United States with financial assistance from the Mennonite church. Claas Epp’s faction decided to move to the village of Ak Metchet (near Khiva, Uzbekistan) to await the Second Coming. 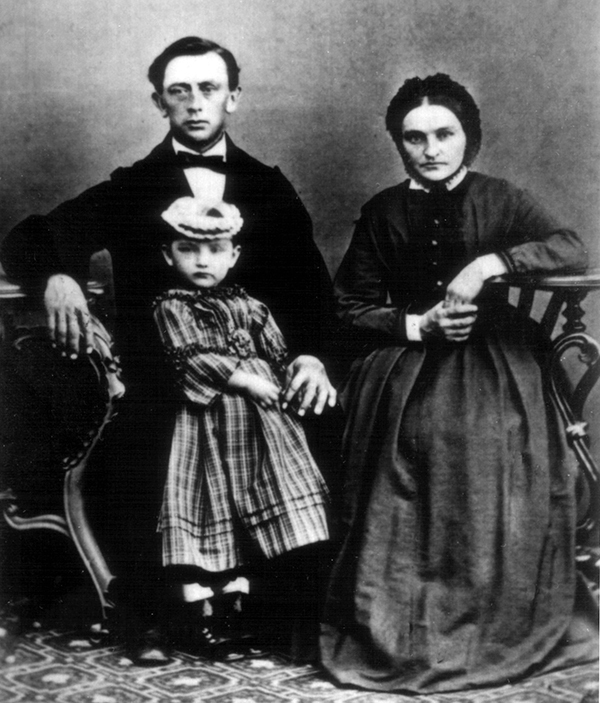 Claas Epp, Jr. at age 38 with his wife Elisabeth (née Jantzen) and their daughter Margareth in 1876. Mrs. Epp is pregnant with their son Bernhard. In April 1884, Jacob's family began the long journey back to the Volga region. Given that his brother Wilhelm had served as a pastor in Wisconsin for several years, Jacob may have traveled to Norka to talk with him about the family's next journey to America. They knew that they would never see each other again. Jacob, Katharina and seven of their children left the Volga and traveled to Bremen, Germany where they boarded the steamship Donau. After arriving in New York on October 17, 1885 they continued on to Peabody, Kansas where they settled and added three more children to the family. Peabody is located in an area of Kansas which was settled by the Mennonite Brethren beginning in 1874. Jacob's younger brother, Johannes Georg, would join them in Kansas in 1889, coincidentally the year that Claas Epp predicted that Christ would return. Claas Epp became ever more eccentric and he declared himself to be Christ's son. His congregation dwindled over the decades and he died in Ak Metchet in 1913. 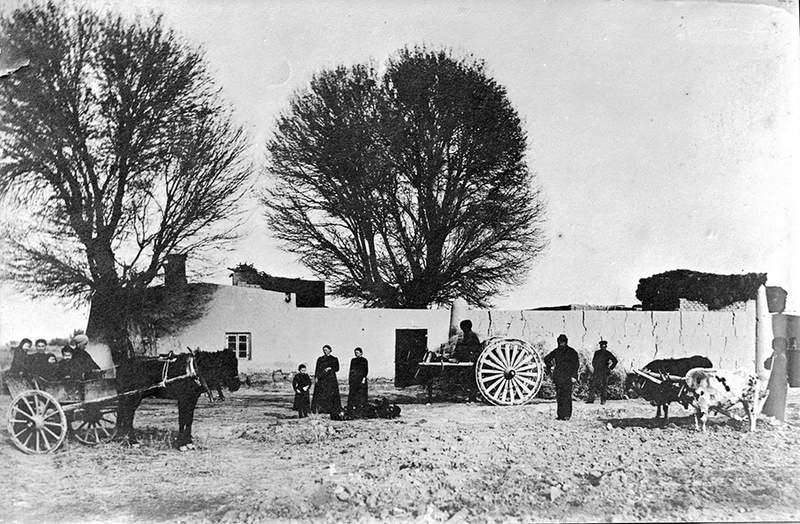 By 1900, Jacob and Katharina had moved west to California where they settled in Fresno. Jacob worked as a bookseller and private teacher. Heinrich Jacob Stärkel died on August 3, 1918 in Fresno, California. Jacob's wife, Katharina Elisabeth, died on August 3, 1926 in Fresno. No one could deny that they had lived a life full of adventure and ultimately found a promised land where they could live and worship freely. Giesinger, Adam. "A Voice From The Old Country: The Starkel Letters." Trans. Paul G. Reitzer. Journal of the American Historical Society of Germans from Russia Vol. 2, No.1 (Spring 1979): 60-65. Print. Ratliff, Walter R. Pilgrims on the Silk Road: A Muslim-Christian Encounter in Khiva. Eugene, Or. : Wipf & Stock, 2010. Print. Through the Desert Goes Our Journey. Agile Arts Productions with the Mennonite Church USA Historical Committee, 2008. DVD.